Start/End Shift feature allows you to record transactions in particular shifts of employees against sales registers. You can start a shift with open register and opening balance. After recording all the transactions during the shift, you need to settle up all the retail operations at the end of shift (or day). How to Start/End Shift in iPad App? 1. First of all, you need to configure Shifts and Register on RepairDesk Web App. The changes you made there will be reflected in the iPad App. 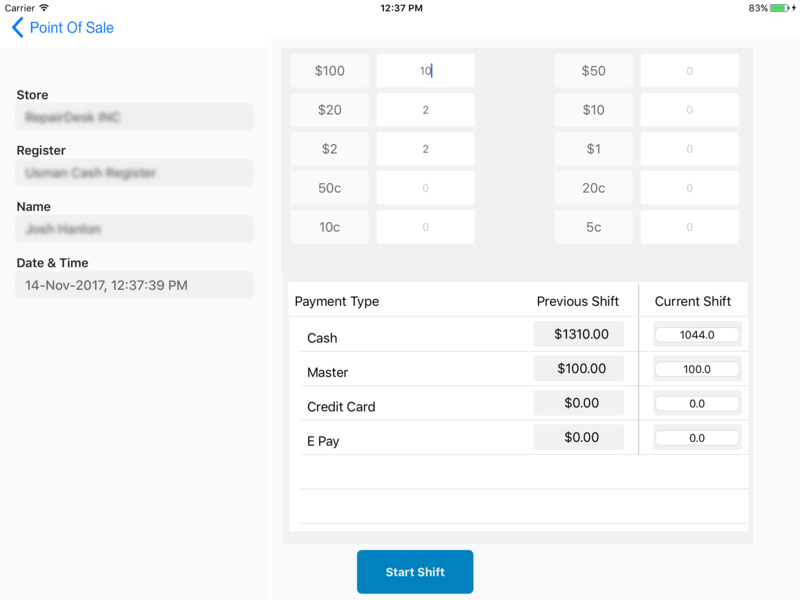 For step-by-step configurations on setting up Cash Registers, please refer to this article. 2. Login to RepairDesk iPad POS App. 3. From the left navigation menu, click on Start/ End Shift to initiate a shift. If you have already opened a shift, tapping on Start/End shift will show you the End Shift Screen. 4. While you are starting the Shift, the iPad App will ask you to select a Register from the drop-down menu. 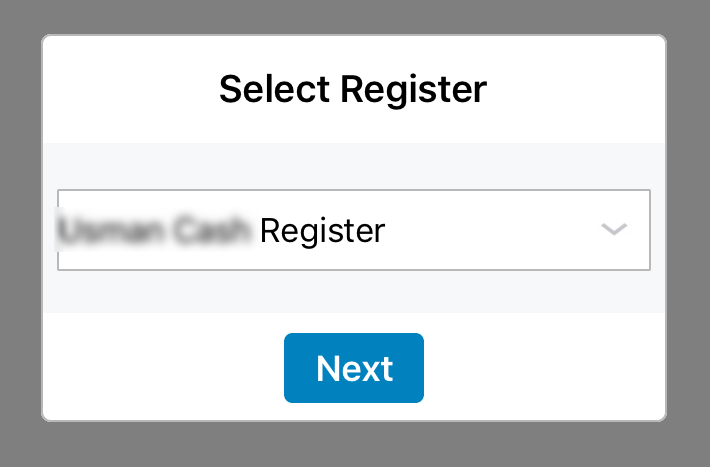 Select the register, and tap on Next. 5. Once you select the register, you will be taken to another screen where accumulative payment types are displayed at start of shift as the opening balance must be verified. 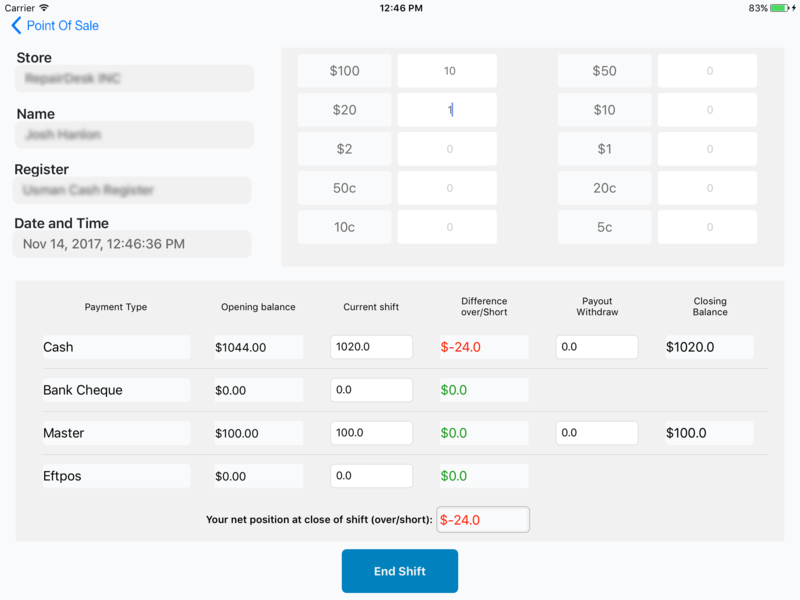 You will also be able to view the closing balances of previous shift under Previous Shift column. You can verify accumulative payment type to start the current shift. Once you verify, you can click on "Start Shift" to begin the shift. You can set different payment methods as Accumulative Paymen Type on RepairDesk Web App from here. 6. When it's time to close the shift, select Start/End Shift from the Left Navigation Menu of the iPad App. Mention the closing balance under the Current Shift fields in front of their respective Accumulative Payment Types. Under Difference column you would be able to see the amount that is over or short from the opening balance. Under Payout Withdraw you would be able to view the amount which was withdrawn from the cash drawer during the shift. Finally under Closing Balance you would be able to view the closing amount at the end of the particular shift. Once done, click on End Shift button. 7. In case suring the shift you need to enter miscellcanious income or receiving cash, you can mention it under Cash In/ Out functionality. 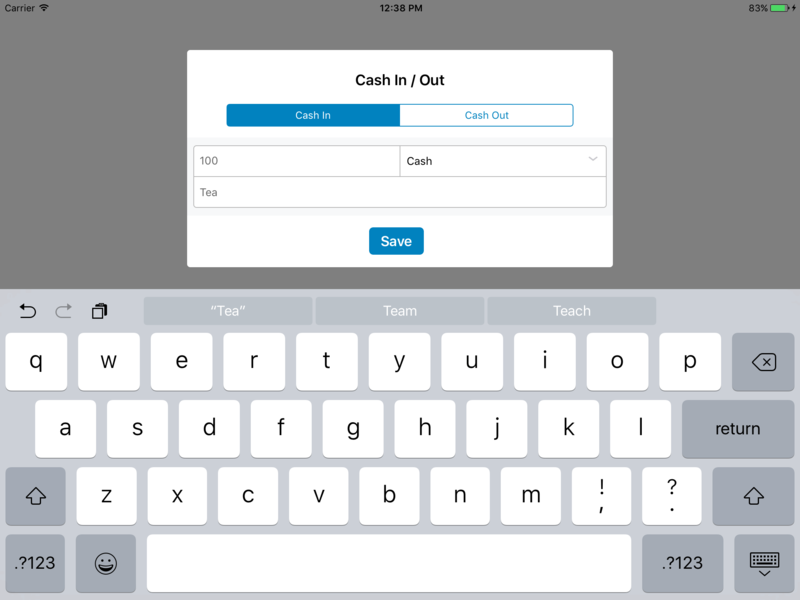 Select Cash In/ Out from the iPad App Left Navigation Menu. Tap on Cash In tab. Enter the amount, select payment method and the reason for the cash income. Once done, click on Save button. 8. 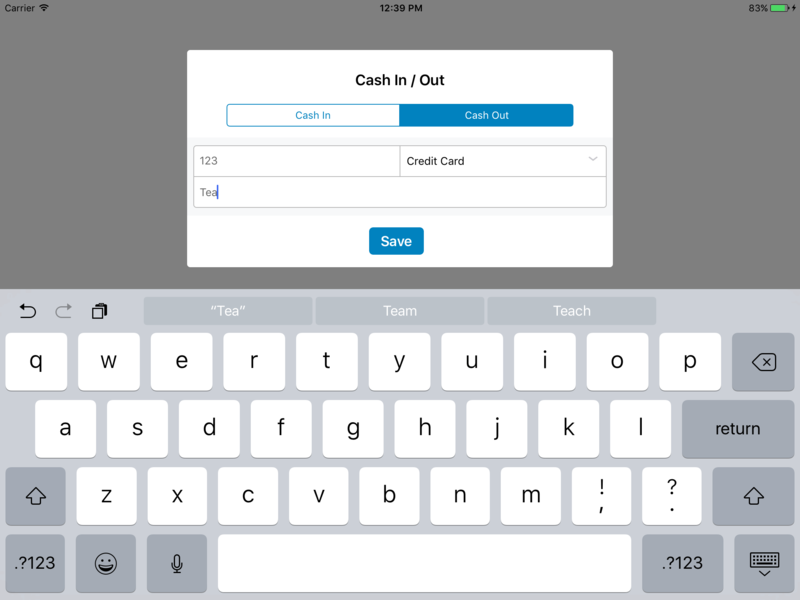 Similary, to account petty expenses, select Cash In/ Out from the left naviagation menu of the iPad App and tap on Cash Out tab. Enter the amount, select payment method and the reason for the cash withdrawl. Once done, click on Save button. Now all of your transactions will be recorded under these shifts, giving you complete picture of your daily transactions.